That’s getting up there, you know? I remember when new technology meant 8 Track tapes. Please stop laughing. I am not kidding. And….as you know doubt know by now…..I have a BLOG!! On WORDPRESS! This no doubt makes me so tech savvy that I am just about ready to get myself an IT job. At school, I am considered to be one of the more technologically adept teachers. I use Google Drive, Wikis, Educreations, Evernote, iBooks, Collaborize Classroom and Glogster. The thing about technology, though, is that no matter what you learn, no matter what you master, you will continuously be reminded that you are, at heart, an idiot. As a very hip, up to date, cutting edge technology user, I follow a lot of blogs these days. One of them is written by a guy named Alexey, at Inside My Glitching Mind. This blog features incredible photos of all manner of interesting things from around the world. One of the cool features is a collection of photos of fences. Fences from all over the world. 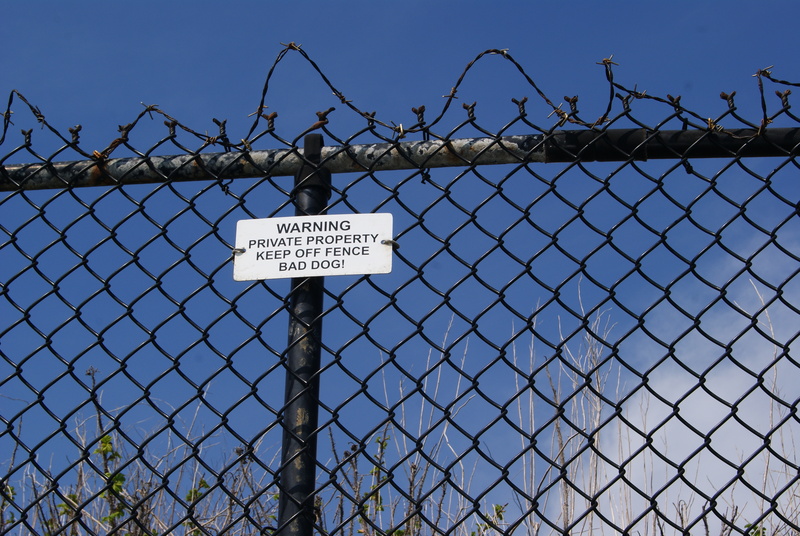 I happen to have two very interesting fence photos myself! Both were taken in Newport, Rhode Island, along the famous Cliff Walk. We were on the outside (poor people) side of the fences, looking in at the glamorous (rich people) side. In order for my photos to be used on his blog, they have to be a certain size. Um. OK? I looked at my photos on iPhoto, but couldn’t figure out how to change the size. I asked my friend, the IT person at school, and she sent me the directions. I was SO proud of myself when I made my photos nice and small! Yay!! I couldn’t wait to see MY pictures on that great site! I wrote a nice email to Alexey and hit “send”. I prepared to give up. So, here they are. What do you think? God only knows if they have enough pixels in them. This kind of shows the greed, and bad grammar, of the very rich. This shows a lovely, welcoming gazebo, just beyond the “Keep out” fence. 57? You’re just a pup! Enjoyed your post. Not surprisingly, my experience with technology follows a similar path. Enjoy yourself and keep writing. Thank you! Haven’t been called a “pup” for a while! Remember when UHF came out? It was just sooooo amazing! Your pictures are wonderful. It took me 6 months as a blogger to upload photos, I think, or thereabouts. And just the last time I posted I had a great picture I took of the “Got History” t-shirt. But when I downloaded it, it was sideways. I couldn’t rotate it, so I googled and got a right side up shirt. Sigh. We are still smarter and more creative than the average bear. Or the average boomer. That’s something, right? Ha! That IS something, for sure! I love the story about the T shirt! I am trying to avoid using clip art or googled images on my blog; I still get hits from people searching for “duck” images, from a post more than a year ago! And it was another blogger (was it you???) who had to teach me how to upload photos! Ah, well! I just found out that my school is buying us all Chrome Books, and I had to go to apple.com and find out what the heck a Chrome Book is! I think it was me — or we talked about it while the other person was telling you how to actually do it. In fact yeah, I’m sure I was in the you’re not a dope, I couldn’t figure it out either!,” camp. You’d think those very rich people could afford a nicer fence. You are light years ahead of me technologically speaking. I know! That fence, those weeds, that snarky message! It was really quite an image, the whole thing. I actually HATE the Cliff Walk. I feel like one of the riff raff, peering through the fence at the elites. Makes me want to foment revolution even more than I usually do! Haha. Ok, if you get to blame your age, then what excuse do I have? I just (tried to) participate in a Twitter rally for #JusticeForEthan, and I have to say, I did not understand what I was doing. At. All. I’m about to turn 32, I don’t think I have a good excuse! Always blame the medium, not yourself!! Technology isn’t complicated: it’s unnecessarily complicated. 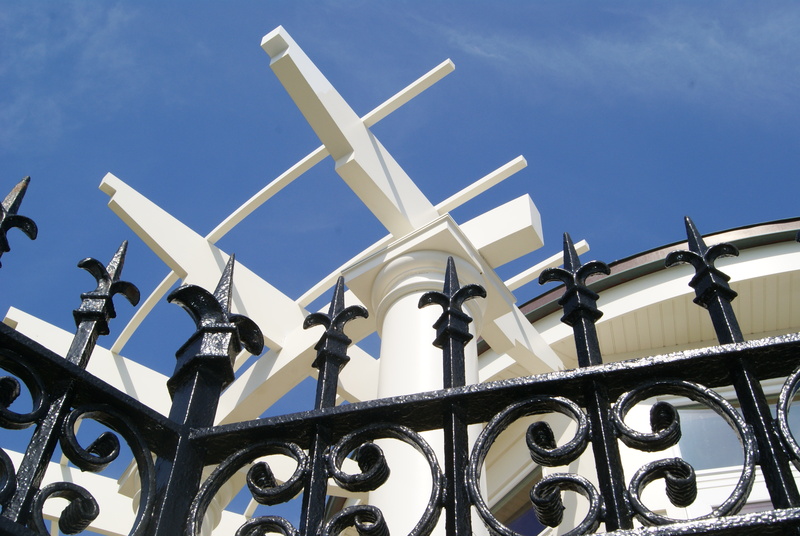 Love the photos – especially the arty shot of the fence and the gazebo. Thank you! I thought it was just such a cool juxtaposition of black and white. Way too obvious a metaphor, but I liked it with that blue, blue sky! My (adult) children can’t get their heads around the fact that when I was their age there were no personal computers, mobile phones, and a gazillion TV channels. I know, isn’t that funny? I told my fifth graders that we had no computer, and they asked if we did our homework on typewriters! I think you might have hit on an important point–you admitted to constantly questioning your technological capability. That’s the same as questioning your current methods and being open to new ones. That, to me, is the most important thing of all. As far as I am concerned tech is just a means to an end–note that’s for ME not everyone, mind you; for IT support people, for example, tech itself is the thing! Like you, I’m an educator so teaching and learning is my ‘thing’ and technology is just among the stuff I use to get the job done. Electronic equipment certainly measures high there among the things I use but I don’t mind admitting that lowly tech such as paper, writing implements (pens, pencils, brushes, markers and the like) and such are also valued parts of my toolkit. Oh, I agree totally!! As soon as I realized (back in about 1988) that I wouldn’t blow up New York with one false move, I have learned to embrace my techie mistakes. Still, I find the complexity of it all daunting sometimes, you know? But my pictures made it to Alexey’s blog, so it was worth it! Fortunately, I started very early on learning as much as I could about software and technologies. My mom avoids them all like the plague. But when I look up words for her on my ipad to help her with the crossword puzzle, she is so impressed! Funny, because MY mom, at age 83, has a laptop, an iPad and an iPod touch! I keep coming back to this post for the second fence photo. It’s beautiful and so interesting – definitely worth enlarging and framing. I am most definitely not a photographer, so I got lucky with this one. And what a beautiful day that was! Ha! My sons and husband and I are holding on to our “dumb” phones desperately, as we have NO desire to be constantly connected! As for Twitter…..I didn’t use it at all until yesterday, when I was able to follow events coming out of Boston with updates literally every second.